Victoria, Mahé (Seychelles) – March 25, 2017 (travelindex.com) – A lot has been said about discrimination in the world of tourism for a long time, but hearing Gilbert Lamory, the Vice President responsible for Development for GIHP (Groupement pour l’Insertion des personnes Handicapées Physiques) of France speak, the press present agreed that it was clear that a lot could still be done to respect those who are physically handicapped. Gilbert Lamory was meeting with Alain St.Ange, the Seychelles Candidate for the post of Secretary General for the United Nations World Tourism Organisation (UNWTO) who was on a working visit to Europe this week to meet the press and Government Officials for the UN election for its World Tourism Organisation set for 11 May in Madrid. This was the opportunity for Gilbert Lamory on behalf of the GIHP to present Alain St.Ange with a letter of endorsement, and also copies of the GIHP’s Worldwide coordinated call for support for St.Ange. Mr Lamory, who has been a for a number of years the advisor and instructor at the Federation National des Offices du Tourisme et Syndicats d’Initiative to push forward the plight of the handicapped, spoke with emotion to the press present at the presentation of the GIHP letter of endorsement to St.Ange. “There is still a lot to do in many countries for the handicapped persons to travel freely ” he said before adding that in 2017 the handicapped population of the world had the opportunity to help get someone elected to the post Secretary General of the UNWTO who was particularly concerned of the concept of tourism for all. “In effect the election of the new Secretary General of the UNWTO that will be taking place in May will have amongst the candidates Alain St.Ange, who is clearly concerned by the facilities available for those falling in the grouping of handicapped travellers” Gilbert Lamory said. Alain St.Ange, the Seychelles candidate for the post of SG of the UNWTO said that ‘Tourism of All’ concept is overdue. “In this day and age we must all work together for everyone immaterial of his of her physical disability, but at the same time immaterial of the colour of his or her skin, of their race, of their religious belief, political affiliation or sexual preferences, to be respected firstly and welcomed with open arms as they travel the world as tourists” Alain St.Ange said. “We should not discriminate among people on the basis of differences in their skin colour, of their race, of their religion, of their politics and sexual preferences,” said St.Ange as he explained his strategies for helping the disabled traveller. “As Secretary General I will raise the cause of tourism for all as a must for a UN body. 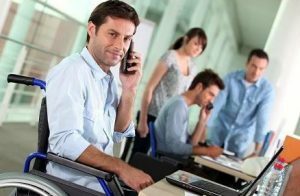 My strategies to help not only the disabled traveller, but also to help the person with a disability find work in the tourism industry are clear. We all know that travel produces long term health benefits with leisure opportunities relieving stress. We also know finding employment for people with disabilities is a must as we grow up and respect people…simple” said St.Ange. The GIHP Grouping presented Alain St.Ange with copies of letters written to political figures past and present and to other influential personalities to lobby for St.Ange to be elected as SG of the UNWTO. “In Seychelles we respect the people with a disability, we have moved to realise that their strength is their difference, and we prefer to refer to them as the handi-abled as we open doors for everyone. Today is some part of the world the state of tolerance is at its lowest with rhetoric based on discrimination of colour, race, religion, politics and sexual preference seen as being terrible. There is hate, there is poison. Together we can work with the press for a new departure to sideline those who need help accept that tourism and the world of tourism is for all” said Alain St.Ange before adding that everybody counts and everybody has dignity. Support for the Seychelles Candidate St.Ange continues to grow. The Seychelles Candidate has already received Letters of Endorsement from President Danny Faure of the Seychelles, from Sir James Mancham, Seychelles founding President who wrote an open letter about his support for the Seychelles St.Ange bid for the United Nations just a week before he passed away, the Indian Ocean Vanilla Islands Organisation (Comoros, Mayotte, Madagascar, Mauritius, Reunion and Seychelles), the Africa Ports Association of Eastern and Southern Africa (PMAESA), Tanzania Society of Travel Agents (TASOTA), the Seychelles Hospitality and Tourism Association (SHTA), Fred W. Finn, the World’s Most Travelled Person Guinness World Records, the Seychelles Hindu Kovil Sangam Association, India’s important N.R.I. Welfare Society, the Creole Travel Services of Seychelles and the Association of Tourism Professionals of Mauritius (ATP), Eden Island Seychelles, Bea Broda the known Producer/Writer/Host/Speaker from the Americas who wrote: One candidate that stands out to me is Alain St.Ange, the former Minister of Tourism of Seychelles. In the seven years that I have been familiar with his work, I have witnessed the extraordinary dedication, enthusiasm and visionary brilliance that resulted in his enormous success in this role. St.Ange took a relatively small island nation in the middle of the Indian Ocean and created a way to bring Seychelles to the forefront of global attention with the enactment of the Carnaval International de Victoria. This international event experienced six years of success, not only bringing interest and tourism to the nation, but proudly unifying all of the people who live there towards a common goal. In addition, St.Ange was a founder of the Vanilla Islands of the Indian Ocean, a consortium designed to combine the strengths of the islands located in the Indian Ocean to present a strong front in a competitive market. He has worked ceaselessly in the direction of the absolute success of those issues to which he cheerfully commits his time, and I would personally like to see someone with his considerable vision, dedication and creativity take the helm of an organization as influential to tourism as UNWTO, and Theresa St.John, the reputed Travel Writer who said “It’s not often that I have the chance to interact with someone who speaks so passionately about travel, tourism, and the people behind the ‘business of it’, the Hon Xavier-Luc Duval, former Deputy Prime Minister of Mauritius who had responsibility for Tourism and also a past president of the Indian Ocean Vanilla Islands, now Leader of the Opposition in Mauritius and the Seychelles Chamber of Commerce and Industry.